I did have a little cooking disaster in the process... We just opened a new jar of red pepper flakes. The jar we just finished had a twist off cap, so I'm used to just twisting off the cap and adding a few shakes through the holes in the bottle. However our new jar has a pop-top, not a twist off. I wasn't thinking and twisted off the top and started to shake when I realized that I dumped about 1/2 of the container of flakes into my sauce! I was able to get a lot of them out, but this dish was still super spicy! Luckily we like it spicy, but next time I'll only add about a half-teaspoon of flakes! 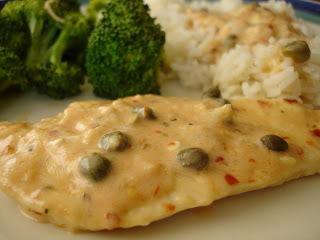 The creamy tomato chicken dish sounds delish!! I'll have to go shopping for capers and cream and leave out the pepper flakes since the kids aren't into spicy meals just yet but hubby and I will definitely add to our dish!! Thanks for sharing! If I create a dish wherein I can remember the ingredients, I'll share!! Yum! If it is half as good as cream cheese chicken DH is going to be excited! ME - you are a little cooking genious over there. I print up your recipes to use. I already have a whole binder of Mary Ellen's recipes!